(TB1ZPQX) Geocoin Club October 2007 Geocoin - Todie's Wild Ride: Be A Safe Biker! Todie's Wild Ride: Be A Safe Biker! Use TB1ZPQX to reference this item. Don't assume that you are visible to a driver. As a motorcyclist, it is your responsibility to make your presence known to the driver. Select and wear an appropriate helmet with retroreflective materials. Wear bright, contrasting protective clothing. If you choose darker clothing, wear a fluorescent vest. Make sure the other motorists can see YOU! We can get this message out to more people if YOU help! Release a coin of your own. Gallery Images related to Todie's Wild Ride: Be A Safe Biker! Benben really liked this coin. I told him a quick synopsis of Sputnik and he said, "cool". The kids and I will review the bike safety options. 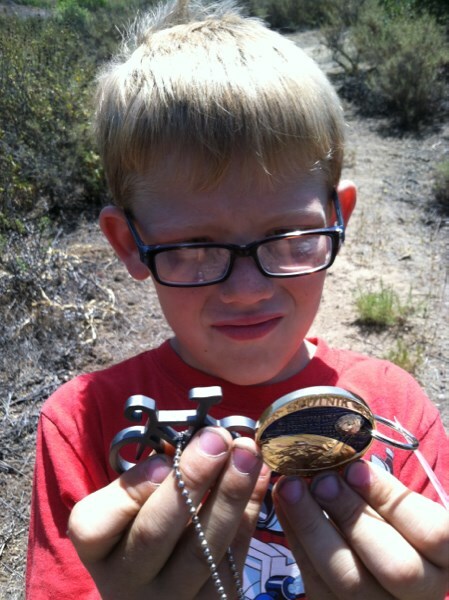 Cool a puzzle cache with a geocoin in it. Could not resist that. However, a little sad. Water got into "Into the Wild..and Out [RST2]". Found tarnish on the gold portions of the geocoin. The geocoin and its accompanying paper work were in a small baggie, but water got into that also. Even the laminated tag was all wet and coming apart. Fortunately, all of the paper work can still be read. My wife and I, very carefully unfolded the folded up sheet and it can still be read also. Computers is what I do, and before I pass this geocoin on, it will have new paper work reprinted and the newly printed tag re-laminated. Also, I have managed to get most of the tarnish off of the coin itself, but not all of it. But, I have not given up on that either, I hop to have it looking as good as new before I pass it on. I will give it my best shot, anyway.